The Patriots opened the scoring with a field goal, but Tampa Bay would respond with HB Doug Martin leaping over a goal-line pile to punch the ball into the endzone. QB Tom Brady would overcome an early interception to throw a touchdown pass to WR Chris Hogan and the Stephen Gostkowski would connect on another field goal to give the the Patriots a 6-point halftime lead. The game wouldn’t become close until just before the final two minutes, when QB Jameis Winston found TE Cameron Brate in the endzone to pull within 2 points. New England kicked an insurance field goal on a night where Tampa Bay couldn’t make their own kicks, and they would come away with the 19-14 victory. With that, we give you our PFF exclusive takeaways from the contest for each team. Brady had a couple bad throws in the game, one resulting in an interception, but otherwise he played well, particularly when the offensive line gave him time to throw. When kept clean, Brady completed 25 of 27 passes at an average of nearly 10 yards per attempt. When pressured, however, only five of 18 dropbacks resulted in a completed pass, though when adjusted for drops and throwaways, he was still at a respectable 70 percent completion percentage. Amendola had his best game of the year, as he caught all eight targets thrown his way and forced two missed tackles after the catch. Brady had a 106.8 passer rating when targeting Amendola, who caught half of his passes against rookie defensive back Justin Evans. The most notable downgrade as a receiver came on his offensive pass interference penalty. Oddly enough, he probably made the catch harder than if he had not pushed off as he had to haul it in one-handed, but it still cost the offense nonetheless. While the Patriots defense started strong before giving up a ton of yards late, this was never really a fantastic defensive performance. It was a lot of scheme and the Bucs missing open players. But one positive forthe Patriots was McCourty’s play. He was all over the field, making a team-high 11 tackles and three solo defensive stops. He was targeted six times as the primary coverage defender and allowed just three catches for 16 yards, with only three of those yards coming after the catch. The Patriots didn’t have much of a pass-rush in this game, and that seemed to be by design. A lot of plays they only rushed three and even then they were playing more of a contain role and seemingly trying to make Winston throw out of the pocket. But still, Marsh had a really tough game as he recorded just two quarterback hurries (one of which was a cleanup) on 29 rushes. He had a 38.6 run-defense grade as there was a handful of plays in which he lost his outside contain and allowed the Buccaneers ball carrier to get outside of him. And of course, there was his inexcusable roughing the passer penalty at the end of the first half. Jackson got off to a slow start in this game, but eventually turned it on and ended up being the game-changer that he’s been known as his whole career. His five catches for 106 yards look good on paper, but they looked even better in the game. 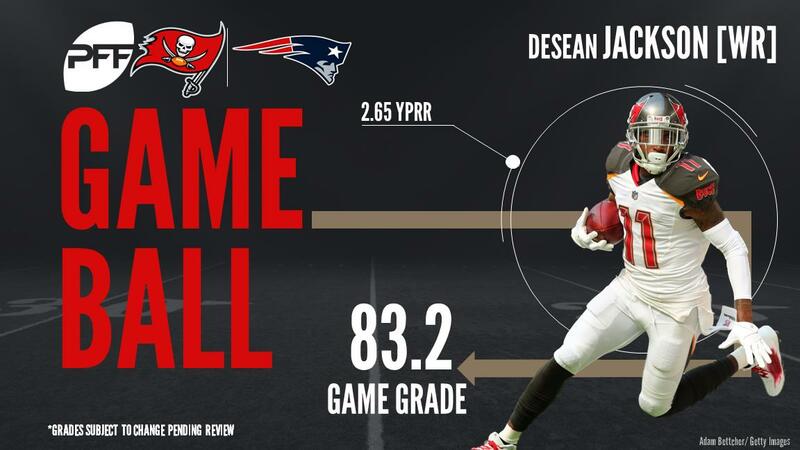 Jackson made two huge toe-tapping sideline catches to keep drives alive, and then his 41-yard slant route on 3rd-and-2 was essentially the only reason the Buccaneers were able to have a chance to win it at the end of the game. Winston had a 97.5 rating when targeting him, the second-highest figure on the team. In Martin’s first game back this season, it seemed as though the Bucs had him on a bit of a snap count. He only got seven carries in the first half, and six more in the second (largely due to the come-from-behind nature of the game at that point). But he really made those 13 carries count, racking up 74 yards and a touchdown. Martin averaged 3.2 yards after contact per carry, despite still looking like he wasn’t quite in full-on football game-shape. Robert Ayers was held without a sack, but he was still quite effective as a pass-rusher. He had nine total pressures on 32 snaps rushing the quarterback, one more than he had in his first three games combined on 101 pass-rush snaps. Ayers didn’t do as much against the run, but did pick up one stop in run defense. Hargreaves had a couple nice stops in run defense, but in coverage he had a below-average performance for the third-straight week. He allowed receptions on all six targets into his coverage for 94 yards, a touchdown, and a perfect 158.3 passer rating. Through four games, Hargreaves has allowed the most passing yards (354) of any defender in the league.